Every year I hear about the Polar Bear Dip and shake my head at the crazies who plunge into a freezing cold Lake Ontario on New Year’s Day. Insanity. I wanted to try it. Let me preface this by telling you that I am the same person who has to be physically dragged by my friend ( Melissa is deceptively strong) into the cold plunge pool at the spa. You don’t need to submerge yourself! You don’t need to , and you shouldn’t. Its not safe to submerge. It is recommended to only go in as far as your abdomen. This makes it A LOT more doable. Its really more of a run in, run out than a plunge. I actually only went in up to about the level of my shorts. Being a tall chick worked in my favour. Let’s be honest , we already know that onesie pajamas are awesome…but they are especially awesome for the dip. I did the dip in some yoga shorts and a tank. I also brought with me an entire change of clothes, two towels, extra socks, and a bathrobe. I could have eliminated much of this with a onesie. My smarty pants friend Natasha wore a cute snowman onesie with her bathing suit underneath. So after the dip , she just had to towel off and put that onesie right back on. If I do it again, I will do the same. You’ll need some water shoes. Or, some shoes that you don’t mind getting wet. The water is full of rocks, so you don’t want to go barefoot. Flip-fops are too slippery and will come off as you run in. I got my water shoes at Wal-Mart for $5.00, score! Your feet will go numb quickly. Just before we ran into the water, a Habitat for Humanity staff member said, ” Your feet will go numb, so be careful.” Thank goodness he told us because I hadn’t thought of that. Duh, Ashley. But that truly was the worst part and even that wasn’t too bad. It turned out to be a good thing that we had a little walk to get back to the car post-dip, as it got the circulation back into our toesies. Right after dipping someone could have dropped a bowling ball on my foot and I don’t think I would have felt it. You will feel amazing afterwards! Everyone at the event was in a really positive , encouraging, celebratory mood , and it’s infectious. You’ll leave feeling pumped and armed to face the new year with a smile and sense of accomplishment. 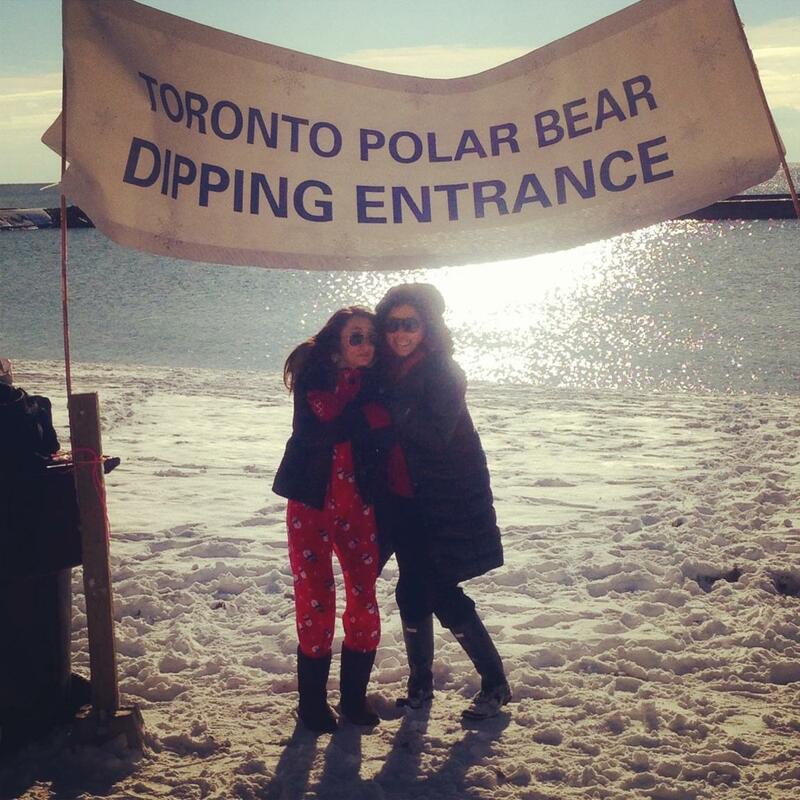 So…Polar Bear Dip 2014, who’s in??? Welcome to The Neon Leopard! The Polar Dip has been added to my bucket list! I was supposed to do this too this year but for some reason, I didn’t. I’ll do it next year for sure. Great job. Thanks for the tips. Thanks! Its really not that bad. I think you’ll be glad you did it! Great wasy to start a year. Thanks for reading! Jan 2014, I’m there! Great post! !